Discontinued Turntables - H to O - audiotools.com. Made 3 turnable models from the early 80's into the early 90's, the TT1, the improved TT2 that came with a Linn Basik LV X as standard and the TT2e verion that had an electronically controlled DC motor versus the standard AC motor that the TT2 had. The first turntable the company introduced was the TT-2000 a budget DJ deck they put on the market in 2001 and sold until ca. 2007. Specification is fairly basic, it is a belt driven budget DJ deck that has a light alloy platter, strobe pitch indicator and a +/- 10% pitch control. Arm is a cheap S shaped device with an Ortofon connector for the headshell that offers weight and anti-skate controls, saving grace is the supplied Audio Technica pick-up that is somewhat better than the horrid examples you usually saw supplied with budget DJ decks and also means that stylus replacements and upgrades are easily available. RRP at the time of introduction was 149.99 UKP but they sold for well under 100 UKP. You will probably only see this model for sale in the UK and France and as far as second hand prices go; excellent boxed or new examples go for about 30 UKP or less while more tatty ones go for under 20. The company did for a year or so (ca 2004) sell this model to the home market as the Acoustic Solutions TT-2000 that was identical in all respects except that it had a normal platter mat rather than the slipmat the Home Mix version came with, but AS replaced it in 2004 with the Acoustic Solutions SP 131, note also that the turntable can be used with both 115v or 230v power supplies but the switch for this is actually hidden under the platter. The company also sold a kit called TT-2000M that featured two TT2000 turntables in addition to a Home Mix - Mix-1 mixer, Home Mix Can-S DJ headphones and a Home Mix MC-1 dynamic microphone. Initially the TT2000M was supposedly also made available without the accessories i.e. headphones and mic but we never saw that version for sale, but in 2003 the microphone was dropped from the kit. The RRP of the TT2000M was 349.99 UKP including VAT when it was introduced in 2001 but as with the full decks actual retail price was significantly lower. Acoustic Solutions introduced the Home Mix TT-1000 in 2003 as a part of the TT-1000M DJ kit package that in addition to two TT1000 turntables included a Home Mix - Mix-2 mixer and a Home Mix Can-S DJ headphones. The package was a sold as a cheaper option to the TT-2000M listed above but in many respects the TT1000M was better than the more expensive kit, the Mix-2 is better than the Mix-1 and the 2 turntable models seem mostly identical, in fact the only difference apparent between the 1000 and 2000 models appears to be the height and lower weight of the base and the larger suspension feet on the 1000, the TT1000 base is twice that of the TT2000 while it is somewhat lighter due to more plastic and less metal being used in its construction. Otherwise the specifications and sub-assembly’s appear identical although it is possible that the 1000 has an inferior motor, the company never gave out any specifications on the motor subassembly of either table. The TT1000 turntable was never sold individually, however the company introduced the Acoustic Solutions SP 131 as a home deck in 2005 that is the TT1000 minus the speed control and the slipmat replaced by a normal table mat, note also that like the 2000 the TT1000 can be used with both 115v or 230v power supplies but the switch for this is actually hidden under the platter. The TT-1000M kit was discontinued in 2007 and replaced with the current Home Mix TT500M kit. The Home Mix/Acoustic Solutions TT-2000 technical specifications are : Supported speeds: 33 and 45 RPM Speed control: +/-10%. Speed indicator: Strobe. Drive system: Belt. Automation: Manual. Supplied pickup type: moving magnet. Size: 44.5 x 7.5 x 34.8cm (Width x height x depth). Weight: 6.1kg. Power requirements: 220 ~ 240v or 110 ~ 120v, switcable. 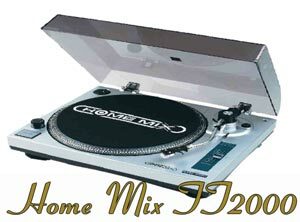 The Home Mix TT-1000 technical specifications are : Supported speeds: 33 and 45 RPM Speed control: +/-10%. Speed indicator: Strobe. Drive system: Belt. Automation: Manual. Supplied pickup type: moving magnet. Size: 45 x 15 x 35cm (Width x height x depth). Weight: 3.75kg. Power requirements: 220 ~ 240v or 110 ~ 120v, switcable. Power consumption: 8 watts. Made the futuristic Air-Bearing Turntable in very limited numbers in the late 70's, this was an attempt by the company to break into the turntable market and featured a couple of innovations like an air bearing and an odd linear tracking tonearm, but it was expensive to make, unreliable and did not perform as well as expected so plans for it were dropped before production was really started in earnest. But some portions of the technology survived, for reasons unknown the air bearing from this table turns up in the Coloney turntables and the construction techniques used in the making of the arm were used in the making of the Infinity Tonearms. At the least one budget DJ table was sold under this name but is mostly seen on the second hand market in central Europe, the WST-1200 Professional, a basic belt driven unit that has very little to recommend itself and can be had used in Germany for as little as a few euros. This company made at the least 4 turntables while it was still in the hi-fi business, namely the T-1000, the T-2000, the T-4000 and T-6000, but the only model I have seen was so healvily modified that I am at loss to describe it, if you have any further info I would like to hear for you. This Swiss company invented the belt driven turntable which has been the basis for the bulk of the quality turntables ever since, their turntables were often sold under the Goldring name in the UK and as Bogen in the USA. This brand is now licensed by the Dutch STL/Supertech group and has no relation to those old Swiss Lenco's mentioned above but nevertheless they have been making turntables under this name since 98 or so, the budget L-3081 was discontinued in 2002 probably since their was not a lot between it price wise and the L-3086 that is still being produced. The 3081 is a basic belt driven semiautomatic turntable (i.e. features a tone arm lift) that sported a magnetic cartridge but unlike it's big brother did not have a built in preamp, wow and flutter was quoted as less than 0.2% and rumble as less than 30 dB, size is 417 x 360 x 108 mm and weight is 2,98 kg. There more upmarket L 3804 and L 3805 players were produced from 1998 to 2000 or so, are both semiautomatic and came with a Ortofon OBM5 cartridge (can use any OM stylus as a replacement), quoted wow & flutter is less than 0,2% and they both share the plinth with dimensions of 415 x 110 x 320 mm. The Linn LP12 Sondeck has been made now for almost 30 years with only minimal changes, this means that owners of even the oldest variants of the deck can upgrade to a better spec using the upgrade options the company offers for their current models, and an alternative to that Naim offers the Armageddon power supply for the same deck. Clearlight Audio also offers a RDC anti-resonant platform cut especially for the LP12 and the Funk Firm offers a number of modifications for older LP's, these include structural mods and replacing the motor with a DC unit. Made quite a bang in the Hi-Fi world when they introduced the PD-300 player in the early 80's, it featured a small pump that created suction on the record platter, this turntable outperformed some of the more expensive European and American audiophile models by quite some margin and was for a while a reviewers darling, later the company introduced a variety of players using the same technology like the PD-310 and the PD-375. Sadly the Luxman company stopped making LP players when they were bought by Alpine. Sold a high end turntable in the late 70's and early 80's, rumour has it that it was a top of the line Micro Seiki but judging by pictures it was acually a Nakamichi model. ADS, the company that owned the Meitner brand has a support site up for that Meitner and Musatex Melior, they have info and a user manual up for the visually striking Meitner MT-2 platterless turntable. Made the Starlight broadcast turntable in the 50's. The Michell company itself holds out a nice page on their older models. Introduced the MPA TD1 high end direct drive turntable in 1977, this was intended for home use unlike the bulk of their earlier products and featured a high torque motor from Matsushita and was sold without arm. Has been selling Pro-Ject turntables in the USA since the mid-late 90's under their own name, the MMF-2 was a rebadged version of the Pro-Ject 0.5. Early versions of the MMF-7 differed from the current model in that they came standard with the Goldring Eroica H rather than as an option as with the current model, they are otherwise identical. Nota bene if you have an older Music hall turntable then most of the upgrade options available for the Project models are usable with the MMF's, furthermore if you have a model that came with one of 1000 series of Goldring Pickups you can upgrade to the better models above simply by getting hold of the stylus for them since the generator and housing of all the 1000 series is the same, they only differ in stylus profile, this is a simple and idiot proof upgrade. Made at the least 2 high end turntables in the early 80's, there is further info on them here. Manufatured a turntable chassis intended for the DJ market, this was a low budget job that cost around 60 £ when last seen for sale in the latter half of the 90's, the design seems to have originated in the early 80's however and is a fairly typical low end belt driven design. Personally I have never been a fan of their turntables, they were all a fairly average Japanese decks in their day, even when the company was making good products in other fields such as amps and Reel to Reel recorders, and to make matters confusing most of their models looked remarkably similar. There is an old review of the CP-1057 archived here. Oracle sells an interesting maintainence kit for their older models. Another Canadian company called Musical Fidelity (no relation) made a quite worthwhile power supply upgrade to the MK I and Mk II models, should be taken into notice when looking for a second hand model. BTW I have no idea what became of the MF company. There were for a time in the early/mid 90's Discontinued Dual turntables turntables sold under the Ortofon banner in markets that Dual no longer had any distribution in.